TOYOTA CITY, Japan -- Toyota Motor Corp.'s most advanced vehicle, a car that runs on hydrogen and emits only water, has had an ironically low-tech birth and has an equally ironic birthday. Indeed, President Akio Toyoda chose Feb. 24 to commemorate the start of production of the Mirai fuel cell sedan for a reason. Exactly five years earlier, Toyoda was hauled before a U.S. congressional panel and given a humiliating grilling about his company's unintended acceleration recalls. To Toyoda, the futuristic, environmentally friendly car symbolizes both Toyota's rebirth from that crisis and a return to roots in attention to quality and pioneering spirit. "For us, that date marks a new start," Toyoda said at the line-off ceremony for the fuel cell car. "This is not to reflect on the past but rather to celebrate Toyota's new start, where we take a fresh step toward the future." And so far, Toyota is taking baby steps with the Mirai. The car, which actually went into production in December, is being assembled -- at a snail's pace -- in the same back lot workshop at Toyota's Motomachi plant that made the Lexus LFA sports car. A handpicked team of just 13 workers churns out only three of the handmade cars a day. There is no cacophony of andon bells -- indeed, not even an andon chord to stop the flow if problems crop up. There are stacks of parts racks, even a whiteboard, separating cars coming through. And there is no conveyor moving the vehicles. They are pushed between stations like apple carts. Nevertheless, Toyota is slowly raising production plans. In January it said it will now make 2,000 a year in 2016 and 3,000 in 2017. When Toyota unveiled the car in November, executives said it would achieve cumulative sales of 3,000 by the end of 2017. The company plans to build just 700 in 2015, to feed sales in Japan, Europe and the United States. Sales in Europe and the U.S. will begin by year end. In the U.S., Toyota will sell the Mirai for $57,500; federal and California incentives of about $13,000 will lower the price to consumers. 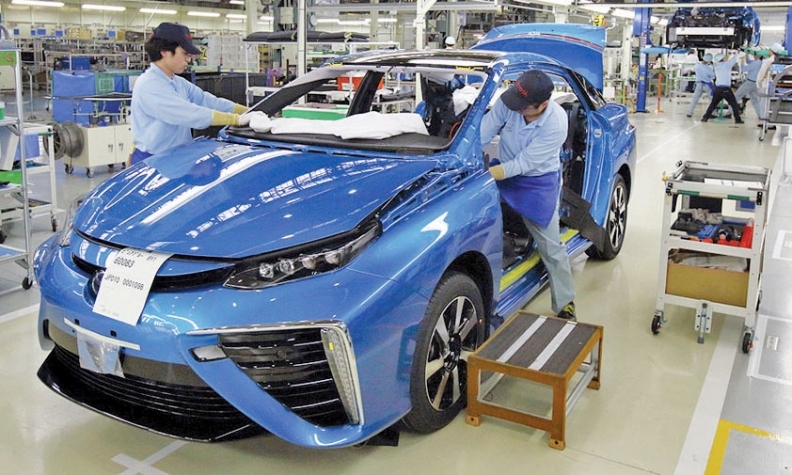 The Mirai went on sale in Japan on Dec. 15, and Toyota booked 1,500 orders by Jan. 22. At a production rate of three a day, that already ensures an order backlog of around a year. "We would also like to apologize," Toyoda said, "for the inconvenience caused to customers who will have to wait."